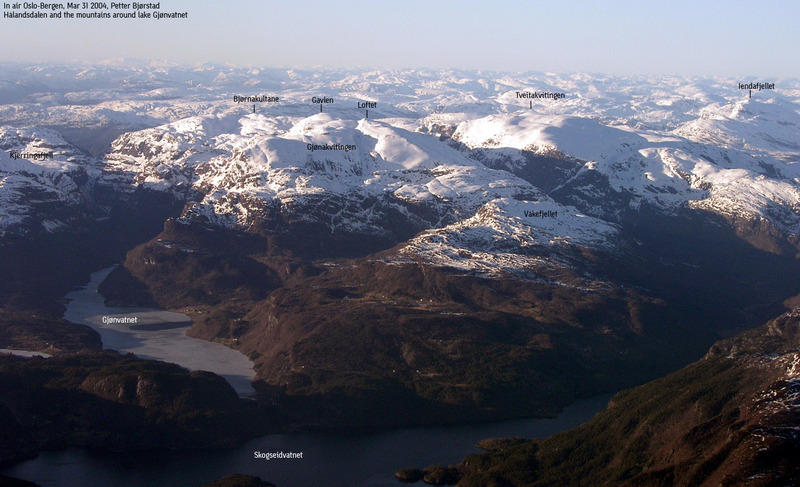 How to get there: The natural starting point is Kvamsskogen on the highway between Bergen and the Hardanger fjord. One can park at the downhill ski area Gåsabotnen, or about 3.5 km further west at Jonshøgdi. Route description: Ski passing the lower part of the alpine ski area and continue a gentle climb up the valley to the Mødalsseter. (If starting from Jonshøgdi then the route cuts across and joins the "standard route" just below the final hills leading up to Mødalsseter.) From here continue in the valley aiming for the saddle between the small, but distinct Såta and the larger mountain on the right. From the saddle climb steeply up (to the right), this is the so-called "Stueveggen" (wall of the living room). Continue over and across the higher ridges and descend slightly into a nice basin before the main summit. The normal ski trail climbs on the left (south) side and then gains the main summit in a large arc to the right. Comments: I have skied this mountain several times with both my boys. If the weather is nice, then this is certainly a classic ski tour for anybody living in the Bergen area. Tveitakvitingen and nearby mountains as seen from the air.